WOW! It was fabulous! It was fun to share this year's CHA winter show with lots of familiar faces and eclectic Friends. 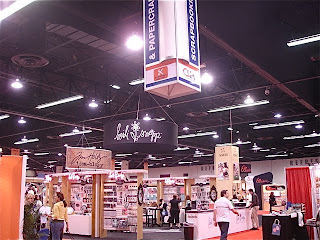 I have too many photos to share so I will be creating a specific gallery by vendor over on the eP forum so you can see all the great new products and samples. The first day was very busy. We arrived just before the doors opened with our plan and map in hand. We raced towards Basic Grey so we could see their fabulous new collections. Lots of new faces this year with Hannah Stamps(Kristi Ferro) and ScorPal(Diana Crick). Some great new products from Cosmo Cricket, Fancy Pants Designs and Crate Paper. 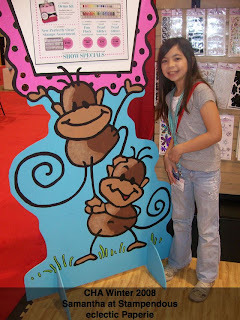 Check out this huge Changito display form Stampendous...and it was flocked with Fun Flock! 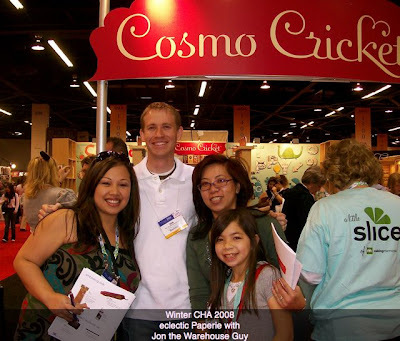 We even got to meet the now famous Jon, The Warehouse Guy at the Cosmo Cricket booth. We spent our first day just searching and gathering info on all the new products that we being debuted at CHA. We ended that first day by hosting a wonderful evening with some of our eP friends, fellow Splitcoaststamper members and vendors who joined us for a great dinner at Downtown Disney's Tortilla Jo's. It was so much fun to share hugs with cyber friends and celebrate all of our successes over the past year. Click on the video below to see a picture montage from our eP Reception. Hi Sam! Hi Daisy! Hi Joy!!!! What a fun time we all shared. I loved your video...it truly was a lovely evening! Thanks for inviting me! ooh - looks like y'all had FUN!! love your video -- GREAT JOB!!! FABULOUS VIDEO! It is just perfect and Jack Johnson rocks! Makes me feel like I was there. Great video! Looks like a lot of fun for all! !